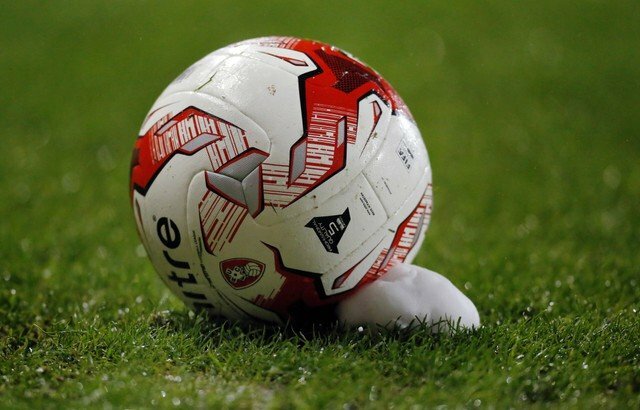 In a game that saw three penalties and a sending off it was also a game of two halves this evening at the New York Stadium for Rotherham United when they went in with a deserved lead at the end of the first half to collapse and lose in the second forty-five minutes. The Millers came out of the blocks running and when Neil Taylor dithered the Rotherham winger Jon Taylor took the ball from him and drove into the box only to see his shot go inches past the upright. Two minutes later a long throw from skipper Will Vaulks was taken by Villa’s Jack Grealish only for Semi Ajayi to win it back sending a low shot towards goal which visiting ‘keeper Jed Steer got down to well. At the other end Michael Ihiekwe did well to block a shot from Albert Adomah and then again when the ball fell to Conor Hourihane to put it out to safety. A Joe Newell corner for the hosts found the head of Vaulks before falling to Jon Taylor brought off a good save from Steer. After more Rotherham pressure Villa got the ball up the other end to Grealish who got the better of Clark Robertson whose clumsy challenge saw the Villa captain go down and referee Andy Madley point to the spot. Tammy Abraham stepped up but Marek Rodak in the Millers’ goal dived to his left and saved with the resulting corner being put over the crossbar by Ahmed Elmohamady. The first yellow of the game went to Tyrone Mings after a second bad challenge on Vaulks. Richie Towell and Michael Smith combined with the latter trying his luck from distance without causing Steer any problems followed by the two combining well again a few minutes later with Newell getting on the end of it but sending the ball wide. On the thirty-fourth minute a header from Joe Mattock found Towell who in turn found Newell whose shot was handballed in the area by Mings who received a second yellow and his marching orders. Vaulks placed the ball and smashed the ball past Steer into the back of the net sending eight thousand Millers fans wild. Villa made their first sub of the evening fetching on Mile Jedinak for Albert Adomah. Grealish made a bit of a meal of a foul by Semi Ajayi and then appealed to the referee to send Vaulks off. Mr Madley was having none of it and the Villa skipper got a lecture for his troubles. Axel Tuanzebe had to be alert after some good work between Newell and Vaulks, although the former looked way offside, followed by Villa Manager Dean Smith getting a yellow card. As the game went into time added on a Newell corner aimed at Ajayi found Robertson who hit a sweet ball which a back-tracking Steer got fingertips to and put behind. The visitors brought on Jonathan Kodjia for Anwar El Ghazi at the start of the second half and, as was expected by most, Villa came out all guns blazing with only the palms of Marek Rodak kept out a shot from Jack Grealish. A minute later a cross from Ahmed Elmohamady struck the arms of Semi Ajayi and Villa got their second penalty of the evening. The Nigerian was booked and Kodjia stepped up and gave Rodak little chance as he put it into the roof of the net to make it one-all. Just three minutes later the visitors were in front after Grealish pushed aside a number of Millers players to send the ball to Elmohamady who put the ball back into the onrushing Grealish for him to stick the ball into the corner of the net to give Villa the lead. At the other end Will Vaulks and Joe Newell saw shots blocked before Jed Steer made a good save from Newell. Just after the hour mark Michael Ihiekwe sent a cross towards Joe Mattock but only found the quick feet of John McGinn who raced on but put the ball wide. Mattock saw yellow a couple of minutes later when he couldn’t keep up with McGinn fetching him down instead. Rodak had to be on his toes to keep out a shot from Kodjia before a Newell free-kick curled just past the post at the other end. Ben Wiles came on for Richie Towell followed by a shot from Jon Taylor which was heading towards goal before it took a wicked deflection off Jedinak to go out for a corner. With fifteen minutes left Vaulks saw yellow after a foul on McGinn. A cross from Newell found Zak Vyner who sent the ball to Ajayi but his shot was deflected for a corner which came to nothing. The Millers brought on Kyle Vassell for his first minutes since February for Ihiekwe. A cross from Vaulks found the head of Michael Smith but the Millers striker put the ball over before some good work from Grealish saw him get the ball to Conor Hourihane who found Rodak in good form with a reflex save. The Millers last substitution of the night saw Ryan Williams replace Jon Taylor. In time added on Tammy Abraham was shown yellow for a poor foul on Williams before McGinn was, again, given too much space and he set up Kodjia who put the ball over the crossbar. The last action of the game saw Villa take off Grealish with Glenn Whelan taking his place. A game that the Millers really needed to win and, in the first half, deserved to do just that. But Villa were much the better team in the second half and despite only having ten men got three points that keeps them in a play-off spot.